I only wish I had taken better pictures of these lovely pink frosted cupcakes but I simply didn't have the proper lighting or the proper time! All that said, I hope this pic I do have helps peak your interest. These gorgeous little treats are lemon yogurt cupcakes topped with swirls of fresh strawberry meringue frosting. The cupcake itself is moist, tender, not too lemony and pairs perfectly with the silky smooth berry filled buttercream. Truth be told, these do take time to make, especially the frosting, but they are worth it. I have made swiss meringue buttercream before but never with pureed fruit so this was a learning experience. I was very worried that adding the fruit would somehow cause the frosting to separate but it didn't. It came together wonderfully and it was beyond smooth, fresh tasting, buttery and just down right perfect. This recipe makes 24 cupcakes and you should have just enough frosting for each cupcake but don't be overly generous with your piping or you will run out. 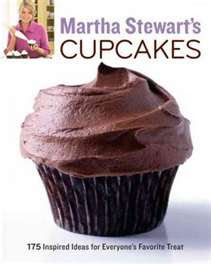 Both the cupcake and the frosting recipes come from my new Martha Stewart's Cupcakes cookbook and both are nothing short of phenomenal. The cupcakes themselves would be superb served with nothing more than a dusting of powdered sugar on top but the frosting really raises them up to an entirely different level. Use a standard swirl tip when piping the frosting. This frosting was made for piping! As you can see by the photo, the tips of my swirls are not tight. This is because I had the intention of adding some fresh strawberry slices to the tops; I never did get that far. Eat these the same day or store in the refrigerator for up to 3 days. Let the frosted cupcakes come to room temperature before serving. The cupcakes sound and look delicious. That frosting is just beautiful! You photo you did share is wonderful - the cupcakes look amazing and it appears you are having fun with your newest cookbook! These are so pretty! The paper cups are lovely, too. Donuts AND Muffins? Oh Yeah !